If you’ve ever read about a personal injury lawsuit, then it’s likely you’ve heard about a person’s “duty of care” towards their peers. This crucial term is often scrutinized during personal injury lawsuits, so it’s important to have a basic understanding of this term and a working knowledge of when it applies to you. United States courtrooms operate under the assumption that all citizens have a duty to act with reasonable care to prevent injuring another person. This duty of care is relevant in almost all situations, but there are times when citizens are expected to have a higher duty of care than normal. These situations include when a person gets behind the wheel of a motor vehicle, acts as a professional or operates as a business or property owner. Under these situations, the individual has a higher duty of care than under normal circumstances. In short, a breach of duty to act with reasonable care is the legal definition of negligence. Proving that the other party was negligent and the negligence resulted in monetary, physical or emotional damages is crucial in winning a personal injury claim. In many instances, proving that the other party had a duty to act with reasonable care is fairly easy. It’s more difficult to prove that the individual failed to act with reasonable care. Most often, courtrooms attempt to look at how a similar person would act in a similar situation to determine what is a ‘reasonable’ standard of care. In cases of medical malpractice, medical experts are often required to testify on how they would act in a similar situation. In cases involving car accidents, courts may compare each individual’s actions to the actions a similar driver would take under similar circumstances. 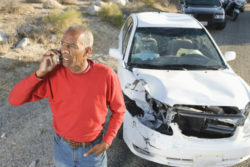 Did you or a loved one sustain serious injuries due to a motor vehicle accident in New Jersey? Don’t let the medical bills pile up while you wait for the negligent party or their insurance company to do the right thing. Right now, you need an aggressive personal injury attorney on your side, fighting to get you the compensation you need, want, and deserve. The skilled attorneys at The Law Offices of Richard A. Stoloff represent clients injured because of a car accident in Egg Harbor, Atlantic City, Galloway Township, Hamilton and throughout NJ. Call 609-601-2233 or email us to schedule a free consultation about your case. We have an office conveniently located at 605 New Road Linwood, NJ 08221, as well as offices in Philadelphia, Pennsylvania.